These are records and documents deposited with the Illinois State Library during the past 30 days. Users should pay particular attention to version identification or dates of publication of documents retrieved. Earlier, possibly superseded, versions of documents are also stored here. Description: Series of Compliance Examinations of the Illinois Gaming Board, A Division of the Illinois Department of Revenue. They are reports on internal control over financial reporting and on compliance with State of Illinois statutes and regulations. 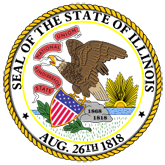 Description: State Employees Retirement System of the State of Illinois Financial Audit - Report on Allocation of Pension Amounts for the Year Ended June 30. Description: Southern Illinois University Financial Audit GAS Reports for the Fiscal Year Ended June 30. Description: Application for Certification to Install Energy Efficiency Measures under Section 16-128B of the Public Utilities Act. Description: Illinois Treasurer Michael Frerichs (D-IL) and U.S. Congressman Rodney Davis (R-IL) will make a stop at Illinois State University on Thursday, August 11 to raise awareness about state and federal efforts to strengthen 529 college savings plans and improve access to affordable education. Description: Petition for emergency and expedited relief to protect from disclosure for a period of not less than two years the proprietary version of Petitioner's 2018 Annual Report. Description: The state of Illinois earned $7.9 million less in investment income in the second quarter of 2016 as a result of the year-long budget impasse, Illinois Treasurer Michael Frerichs said today. Despite the six-month budget plan signed on June 30, the last day of the fiscal year, $31 million remains the projection for missed earnings for 2016. Description: Illinois State Treasurer Michael Frerichs today announced the winners of the 2016 Cream of the Crop Photo Contest. The annual contest encourages young photographers to share their vision of agriculture in our state. Description: Putnam County has been issued a final property assessment equalization factor of 1.0000, according to Constance Beard, Director of the Illinois Department of Revenue. Description: An Ernie Banks rookie card, an 1856 flying eagle cent, and an Elvis Presley concert ticket stub are some of the 21,500 unclaimed property items worth $167,000 to be auctioned live on August 20 on the Ethnic Village Stage at the Illinois State Fair in Springfield. Description: Application for Certification to Install, Maintain or Repair Electric Vehicle Charging Station Facilities under Section 16-128A of the Public Utilities Act. Description: Wabash County has been issued a tentative property assessment equalization factor of 1.0000, according to Constance Beard, Director of the Illinois Department of Revenue. Description: Application for Licensure of Agents, Brokers and Consultants under Section 16-115C of the Public Utilities Act. Description: Application for a certificate of local and interexchange authority to operate as a reseller and facilities-based carrier of telecommunications services throughout the State of Illinois. Description: Petition for Confidential Treatment of Part 551 Report. Description: Petition for emergency relief to protect Petitioner's 2018 Annual Report from disclosure for not less than two years in order to protect highly proprietary information. Description: Motion for Protective Order to protect highly proprietary information of Petitioner's 2018 Annual Dekatherm Report from disclosure. Description: Illinois Treasurer Michael Frerichs will host a reception in the Illinois Department of Agricultures tent at the Illinois State Fairgrounds on Tuesday, August 16 to honor the first place winners of the 2016 Cream of the Crop Photo contest. Description: Illinois Treasurer Michael Frerichs will hold statewide hearings beginning this week to better understand how life insurance companies avoid paying death benefits and what Illinois families can do to prevent themselves from being victimized after the death of a loved one. Description: Tazewell County has been issued a tentative property assessment equalization factor of 1.0000, according to Constance Beard, Director of the Illinois Department of Revenue. Description: Petition for relief to protect Petitioner's Annual Report from disclosure for not less than two years in order to protect highly proprietary information. Description: Petition for Confidential Treatment of AEP Energy, Inc.'s 2018 Annual Answer Time/Abandon Call Reports. Description: Petition for Confidential Treatment of Part 410.45 Customer Call Center Report. Description: Petition for Confidential Treatment of ARES Code Part 451.770 Continuing Compliance Report for 2019. Description: Wayne County has been issued a final property assessment equalization factor of 1.0000, according to Constance Beard, Director of the Illinois Department of Revenue. Description: Kane County has been issued a tentative property assessment equalization factor of 1.0000, according to Constance Beard, Director of the Illinois Department of Revenue. Description: Illinois Treasurer Michael Frerichs (D-IL) and U.S. Congressman Rodney Davis (R-IL) will make a stop at the University of Illinois Urbana-Champaign on Wednesday, August 3 to raise awareness about state and federal efforts to strengthen 529 college savings plans and improve access to affordable education. Description: Application for Certification as Installer of Distributed Generation Facilities under Section 16-128A of the Public Utilities Act. Description: The Illinois Treasurers Office will highlight its office programs, host a live unclaimed property auction, and showcase photos from the 2016 Cream of the Crop contest at this years 2016 Illinois State Fair. Description: Motion for Protective Order to protect highly proprietary information of Petitioner's 2018 ARES Annual Kilowatt-Hour Report from disclosure. Description: Champaign County has been issued a tentative property assessment equalization factor of 1.0000, according to Constance Beard, Director of the Illinois Department of Revenue. Description: Reconciliation of revenues collected under PORCB Rider with actual and prudent associated costs. Description: Petition for Emergency Relief to protect portions of the Call Center Report pursuant to 83 Ill. Admin. Code 410.45. Description: Monroe County issued final property assessment equalization. Description: Sprint will pay $2.3 million and provide the names of 32,000 customers who did not cash rebate checks sent to them between 2003 and 2011, Illinois State Treasurer Michael Frerichs and Sprint said today. Description: For the first time in 10 years, Illinois Treasurer Michael Frerichs is hosting a live unclaimed property auction on August 20th at the Illinois State Fair on the Ethnic Village Stage in Springfield. In advance of the event, the public will get a rare opportunity to preview the auction items on August 5 at the James R. Thompson Center between 11 a.m. - 2 p.m. Description: Statewide hearings begin this week to better understand how life insurance companies avoid paying death benefits and what Illinois families can do to prevent themselves from being victimized after the death of a loved one, Illinois State Treasurer Michael Frerichs said today. Description: Petition for Confidential Treatment of Part 551.170 Dekatherm Report. Description: Opinions and orders of the Illinois Commerce Commission, March 2019. Description: Regional Office of Education #53: Mason, Tazewell, and Woodford Counties Financial Audit for the Year Ended June 30. Description: Department of Central Management Services - State Employees Group Insurance Program Compliance Examination of the Schedule of Allocation for the Two Years Ended June 30. Description: This record provides access to a series of audits for compliance with State of Illinois statutes and regulations. Description: This is a group of press releases making announcements from the Office of the State Treasurer.